After leaving Nelson for Napier, the newly built brig Delaware ran into bad weather. It was wrecked on rocks in a bay between Grahams Point and Pepin Island, about 30 km north-east of Nelson, that is now known as Delaware Bay. Accounts of the incident often focus on the heroism of Hūria Mātenga, the only woman among five local Māori who helped the crew get ashore. 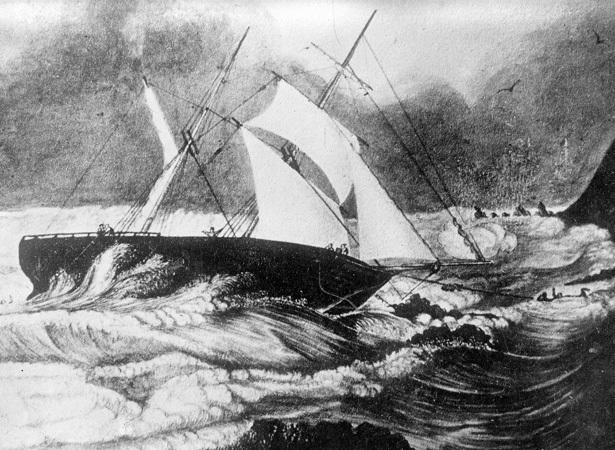 The Delaware left Nelson on the morning of Thursday 3 September in a light easterly wind, but was struck by gale-force winds and heavy rain overnight. By morning the vessel had lost its jib and was in the lee of Pepin Island. Shortly after Captain Robert Baldwin decided to let go the anchor, the windlass broke. The second anchor was then let go, but the vessel continued drifting. Baldwin attempted to run the Delaware ashore, but it struck rocks about 200 m from safety. At this point the first mate, Henry Squirrel, attempted to swim ashore with a lead line that could be used to haul in a stronger cable along which the crew could scramble to shore. Unfortunately, he struck rocks when he dropped from the rigging into the sea. The crew managed to haul him back on board but he was barely conscious and they decided he was dying. By this time local Māori had seen that the ship was in difficulties and hurried to the scene. One or more of them swam out to some rocks closer to the wreck and caught the lead line when it was thrown to them. They then hauled the stronger cable to shore and anchored it to a large rock. In rough conditions Hūria Mātenga (Ngāti Tama, Te Ati Awa and Ngāti Toa), her husband Hemi, and another member of the party, Ropata, went into the water repeatedly to help the crewmen who were crawling along the cable. Hūria’s brother, Eraia, tried to keep the cable off the rocks, while Kerei lit a fire and took care of the men as they arrived on shore. We shouted to the Captain that the hawser was parting, and still he waited to save the mate. He said, when he landed, that he lifted the mate’s eyelids, and fancied that he was dead. From the state in which I saw the deceased, after he had been in the water, I think it would have been impossible to get him ashore. At the inquest crew members also pointed out that they would have all died without the efforts of Hūria and the men. In recognition of their bravery, and to encourage others to undertake such acts, the party were presented with watches at a ceremony on 4 November 1863. The address read to Hūria at this event noted that her name and deed would ‘find [a] place in local history’.